A GREEN WEB HOST! WOW! We wanted to send out this special announcement that as of today, DrakNet is now 100% Carbon Neutral, and you can now brag that your website is truly green. DrakNet now purchases Green Tags monthly for the amount of energy that is used to run the servers, lights, etc. Green Certificates (also known as Green Tags) are a simple way to offset the use of carbon-based energy sources and effectively power a business (or your home) on 100% renewable energy resources, without changing electricity providers. 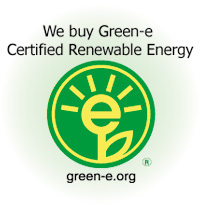 We have chosen to purchase Green Tags for 110% of our carbon footprint, for 100% solar power. What this means is that for any energy DrakNet uses in our operations, that same amount of energy (+10% in case our calculations are incorrect) will be pumped back into the grid from solar power generation, essentially "cleaning" the energy, neutralizing our negative effect on the earth, and allowing us to claim to be "solar powered" and "green". DrakNet struggled for several years between our energy consumption, and service - there are solar hosts in a few solar data centers. The pricing, however, both for shared and dedicated servers is no where near economical and would effectively negate the pricing structure our clients have come to rely on, and their reliability is not yet up to the par of a world class data center. By purchasing certified green certificates (or green tags), we have been able to negate our power hungry servers and make sure that our impact on the earth is neutralized. We look forward to the day when solar energy data centers offer as much value as power hungry data centers - and when they do, we will be there. What are Green Certificates, or Green Tags? * (written by mainegreenpower.org) . . .
DrakNet specializes in hosting for progressive sites, and we actively support non-profit organizations within our community in a multitude of areas - technological, humanitarian, spiritual, educational, political, and environmental to name a few. We currently offer discounted hosting to non-profit community groups, and believe that through sponsored hosting, we can be pro-active in helping to make our world a better, kinder and safer place. DrakNet is owned and operated by a woman, a feat considered almost as rare in this industry as running Windows for a year solid without having to reinstall anything. Flanked by big, burly geek men this enables us to not only provide comforting sympathy when things go wrong, but the power to wrestle ornery technology into submission in confrontations between man and machine. I’ve used DrakNet as a host since I put up my tarot reading site in the late 90s and without fail, the Ladies at ‘Drak’ have been there for me. If I’ve lost a password, have a question about software or am so confused I don’t know what question to ask, Jen at DrakNet gets back to me in a timely and patient way. When I needed to put up a second site, I never even considered looking anywhere else for a hosting service. Going Green is frosting on a cake that was already sweet. I haven’t changed my sites to indicate their new Green status but I do know that when I do, DrakNet is going to be right there for me if I have any problems.